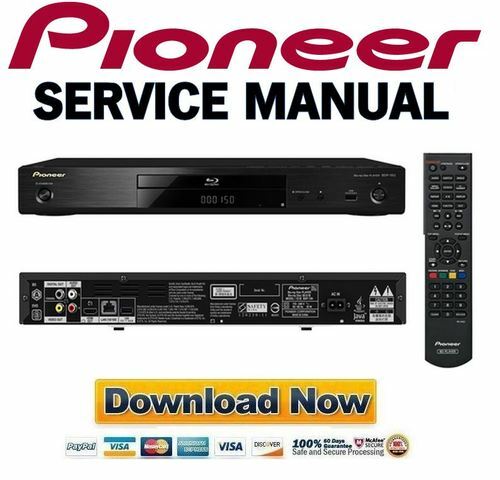 Pioneer BDP-150 3D Blu-Ray Player original service, repair and workshop manual. This service and repair manual is used by the Official Certified Pioneer Technicians. It will help you to troubleshoot and repair your Blu Ray Player! This service manual is very detailed and illustrated with pictures and step-by- step instructions on how to repair/service this device the best way there is! Please note this is the OFFICIAL service and repair manual in PDF format, no scanned-in or bootlegged copy. You can easily print this manual from any printer and any computer! You will have instant access to your download. No shipping fee, no waiting on postal delivery, you can start doing your repairs right away! You are minutes away from accessing a highly comprehensive service, repair and workshop manual as used by the official Pioneer technicians and maintenance employees. It is guaranteed by this specific service manual to get your repairs, service and maintenance jobs done the right way!